This spacious (over 1200 feet) condominium is located on the sixth hole of the Lagos course, in the gated exclusive resort community of the Desert Princess Country Club. This unit has two master suite bedrooms each with a king-size bed. One master suite features a built-in jacuzzi tub with television. Exclusive to this unit is a separate dining area adjacent to the spacious, fully-stocked kitchen. The living room features ample seating, stylishly furnished with an entertainment center with DVD and a pull-out sofa bed. 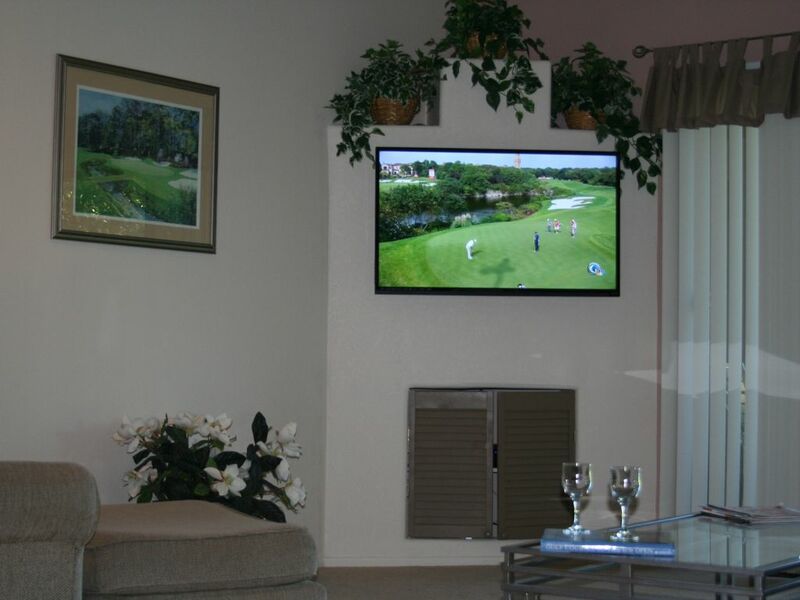 Dine on the covered patio as you watch golfers on the tee box or relax at one of the nearby pools and spas. Pets are not allowed and smoking is prohibited. Guests have access to 27 holes of championship golf, a fully-stocked pro shop, driving range, two putting greens, and clubhouse with dining room and bar. For those who are looking for more golf, guests have access to 36 more holes of golf at the adjacent championship golf course of Cimarron. Tennis players have access to eight tournament-style courts, including five that are lighted. Besides this, the on-site hotel, The Doral, offers over 250 rooms, a restaurant, spa, and fitness center. Our familiy of 4 purchesed this getaway condo for the intentions of using it as a vaction home. We reside 90 miles south west of Palm Springs in Orange County. We are an active family which enjoys the desert active lifestyle. When we can get away from work and our kids weekend soccer games we enjoy heading out to our condo for golf, tennis and relaxing by one of the many pools on the property. This property is our second home and we use it regulary. It has all of the ammentities of our home and we keep it in great shape so it is comfortable for us and our guests. We love the Desert Princess! Fully stocked kitchen, with plents on dishers, silverware, utencils and pots and pans. The condo has a nice green belt off the patio. Tennis Center on site with multiple lighted courts. 27 holes of golf on site and 36 holes of golf at Cimarron adjacent to the property. A great stay for the money! Our stay was very pleasant. The accommodations were very clean and comfortable, and the location is beautiful. Our view looked out on to the golf course, which was lovely. Some things are a bit dated, such as the brass plumbing fixtures, and there were little things missing that I normally find at VRBO rentals, such as soap and shampoo in the showers, but the positives far outweigh the negatives for this gem. Access to downtown Palm Springs was easy, there were scenic walking paths around the grounds, and there were many ammenities that were available. No complaints! We had an excellent stay! Don was so responsive and wonderful to work with. We loved the condo. It had plenty of space and was very comfortable. We loved being right on the course. My husband and son played the course a few times, it was so convenient. Looking forward to staying here again soon! The golf course was lovely and the people running it very conscientious and accommodating The condo needs some basic repairs like the kitchen faucet and better linens for the beds but all in all, it worked out quite well. . The property is clean and circa 80's. The condo could use a complete refresh. Likely one could find a better value in the valley. The condo was very clean and well appointed as advertised. The owner is professional and responds quickly. I had a very quiet and relaxing vacation and would definitely rent from this owner again.